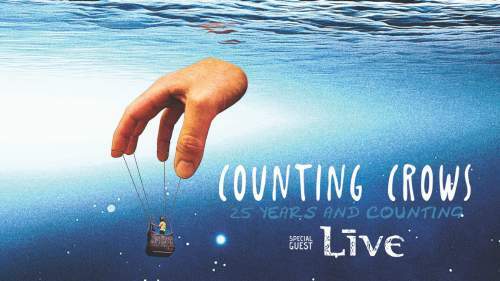 Counting Crows will celebrate 25 years of making music by hitting the road for a worldwide “25 Years and Counting” tour. Joining them are ’90s multi-platinum group Live. Counting Crows – Adam Duritz (vocals), Jim Bogios (drums), David Bryson (guitar), Charlie Gillingham (keyboards), David Immergluck (guitar), Millard Powers (bass) and Dan Vickrey (guitar) – have sold more than 20 million albums worldwide after exploding onto the music scene with their multiplatinum breakout album August and Everything After in 1993. Known for creating unique and innovative concert experiences year after year, Counting Crows is recognized as one of the world’s most pre-eminent touring live rock bands.”The nice thing about having 25 years of music to celebrate and seven studio albums we absolutely love to choose from is that we can play a different show every night,” said Crows vocalist Duritz. Duritz and company have been known to change alter and extend their songs when performing; adding additional instrumentation, tweaking songs lyrics, or changing verses entirely. In fact, most songs in Counting Crow’s repertoire have seen some form of this over the years. It makes every show feel like a completely unique and personalized experience which is a rarity in the world of touring and the main reason CC needs to be on the top of your list of bands to check out this summer.